So, just how do I interact with a child who doesn’t seem to want to interact? Well, not in the way I knew how to play. He rarely responds to his name. I’ve never been able to read him a story. He doesn’t play with toys like my daughters play, he just throws them so he can hear their sound when they land. Freddie is a little boy who doesn’t speak and is more than happy to play by himself. There are so many social skills that do not come naturally to him, but he will need them if he is to have any chance of an independent life. Turn taking, sharing, eye contact, reading emotions, snack table, following basic instruction – ‘sit here’, changing from one activity to another. I was really frustrated early on. I knew part of it would mean just tweaking how I play with him. I just didn’t know how. Again I turned to the internet. There is all sorts of advice. I kept coming across ‘ABA’ (Applied Behavioural Analysis) techniques. This seems to be a very intense method of therapy that I felt just wasn’t right for our family. So I researched it further, attended support groups, quizzed other Mums. Eventually we had a call from a behavioural therapist. It was our turn. We needed this. She came with huge bags of toys, sat on the floor at his level and started to interact with him. Freddie babbles and talks nonsense. She asked me if I babble back to him. ‘Of course not’ I thought. This was completely opposite to what felt natural to me. It has always been important to me to talk to my daughters clearly and concisely so they learn to form words properly. It hadn’t occurred to me once to babble back to him. I then watched her do it with him. It was a light bulb moment. He looked up excitedly at her as if to say “Oh my goodness, she understands me”!! He then babbled back to her with full eye contact, she would then babble to him and so on! I was in tears! This was amazing. She was communicating with him. It did not matter one bit that it made no sense to us. It made sense to him. It was like he’d suddenly met someone who gets him. This lady now had my full undivided attention. She taught me that the simple aim of a game is to teach Freddie that other human beings are fun to be with. This is the grounding to help Freddie in all sorts of social situations. He would quite happily sit in his own world playing things repeatedly over and over again. This isn’t doing him any harm but it isn’t teaching him anything either. In that first hour she connected with him in ways I didn’t know were possible. And here’s the thing, we really can make some progress by simply changing the way we play. Many things that came naturally to me had to be scrapped. New day, new way to play. I had to look at what type of toys he likes and learn how to use them to my advantage. 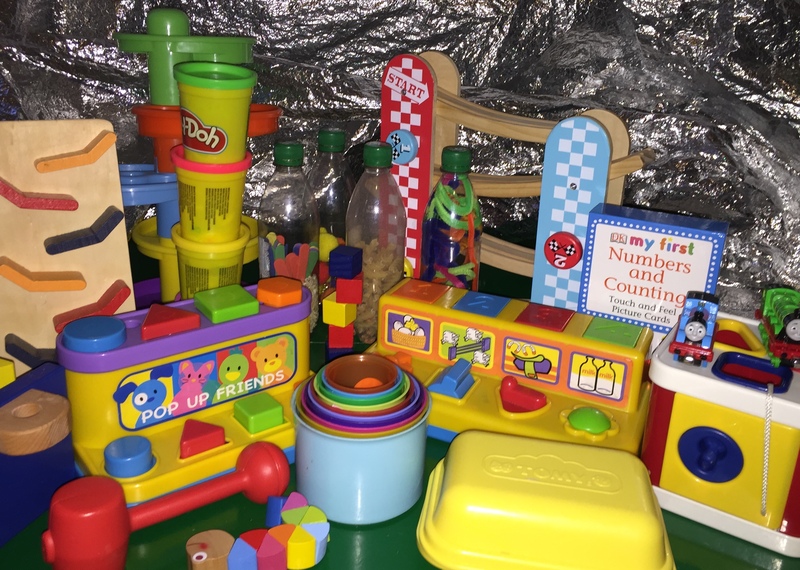 Simple toys like shape sorters, stacking toys become opportunities to take turns. I need to use things he likes, to manipulate him into learning skills. Hammer toys became eye contact tools! Once the toy shoots up in the air I grab it before he does. Then I wait till he makes eye contact to give it back to him. Getting him to point at things can lead to communication in so many areas. Blowing bubbles and making him pop them with a pointy finger again and again. Putting things out of reach that he wants. This is to try to make him point at them. I show him photos of everything. He responds very well to this. One thing I am learning is that he certainly isn’t of low intelligence. Yes, he’s autistic, yes, he has a developmental delay, yes, he has complex learning difficulties. But he is intelligent and he understands a lot of the world around him, more so than I realise. I’ve had to change the whole way I speak to him. A phrase like ‘It’s time to put your coat on, get into the car and go to school’ would be completely lost on him. Everything is simplified to just one word. For example; “Car” “Bath” “Bed” “Shoes” “Food”. Discipline is an area I’m struggling with at the moment. It’s so hard to find a line relating to certain behaviours, either is it because he is frustrated because of his autism, or is he just being a three year old boy pushing limits? Freddie struggles to read typical human emotions. He went through a phase of taking my glasses off my face and throwing them. He would take them off and stop and look at me, becoming excited for me to tell him “NO”. He learnt – That when I take her glasses off = Her voice becomes different = I get more attention. It doesn’t mean a thing to him that I am cross. I once pretended to cry but he thought that was absolutely amazing. In the end I tried ignoring him (and buying spare glasses). When he realised my voice wasn’t becoming deep and loud, and he wasn’t getting a reaction, he actually put them back on my face and didn’t do it again! Result. Granted this wasn’t as much fun as the ‘slap Mummy across the face phase’, but with gritted teeth and trying to keep my face straight (3 yr olds can hit hard) we got there in the end. I don’t know how I would have dealt with it, had it have been him slapping another child though. There are situations that I can’t ignore. I do try to discipline him but I just don’t really understand the best way to do this at present. I am currently on two autism awareness courses and this is something I really want to learn. I just need to show him certain behaviours are unacceptable in a way he can understand. Sometimes this all can seem very complicated. But I’m learning that sometimes it really isn’t. There are occasions when it just clicks into place and is quite simple. We are trying to find the balance in doing things together as a family, and the girls not missing out. The other day, Daddy took the girls out for lunch. I sat at home with Freddie feeling really guilty about Freddie missing out on this lunch, though I knew he would hate it and the entire lunch would be a disaster for everyone. I knew I was being irrational but still I felt guilty (Mummy guilt is a whole new blog by itself). So I thought, how can I stop feeling guilty. I know, let’s take him out for a walk in the push chair instead. However, this would mean preparing him with pictures, holding him down whilst I force his coat on , holding him down to force him in the pushchair, then giving him a picture of somewhere I didn’t have a picture of! Plus it was freezing out. I had this big argument in my head about what I should be doing. Then I looked at him. He was currently content and happy. He was lining and stacking play doh pots, jumping and flapping and squealing excitedly. Suddenly, the penny dropped (literal phrases – a whole new blog) I realised, to ease my guilt I wanted to stop him doing something he was enjoying and force him to do something that would upset him just to make ME feel better!! So I took a deep breath, told the voices in my head to shut up! I sat on the floor and started to line stuff up with him! Freddie’s line, Mummy’s line, Freddie’s line – lets take turns, lets kiss, lets clap and when we complete a line, lets knock it over again and again and again. We had the nicest afternoon. As one of my friends said “Sometimes we just need to follow their lead”. This is spot on! This is where I have to find the balance into my world and his world. His world is important. It’s not all about forcing him into our world. I have to appreciate his world too. I have to join him in it and somewhere in between we’ll meet and have a gorgeous afternoon together. I have just scratched the surface on this particular topic. There is so much more to learn. I just keep remembering the original point. I have to teach him that other human beings can quite simply be – fun. Very well written and really enjoyed reading this Alexandra. Reinforces what I’m doing well /right. My son is now 8 yo. The preschool years were the most challenging. He’s reached a new level of maturity now and we are having lots of wow moments with him lately. I wish you all the best in your journey.